As work got underway this month to make it safer for pedestrians to cross Broadway into the new light rail station when it opens in 2016, a crucial part of the street got more dangerous for bicyclists. On January 13 Sound Transit contractors began tunneling under Broadway at Denny to build a pedestrian concourse connecting a light rail entrance on the west side of the street to the Capitol Hill Station. In order to do the work, contractors had to shut down one southbound lane of Broadway, now walled off by large concrete barriers, and scrub out the bikeway between Denny and Howell. Seattle Department of Transportation’s Ethan Melone told CHS that despite the headaches, this has been part of the plan all along “We knew Sound Transit was coming,” he said. “If we waited to open it, [the bikeway] would be completed, but not accessible, which would be frustrating.”If you’re turning south onto Broadway from Denny, the detour takes you onto the sidewalk along the “big red wall” until you can meet back up with the Broadway bikeway near Bonney-Watson Funeral Home. Should you take the left turn into the partially scrubbed out cycle track, you’ll find yourself playing chicken with oncoming traffic. Worse, if you turn right, you’ll encounter the extremely dangerous streetcar tracks the bikeway was intended to help riders avoid. And for riders coming north up the Broadway bikeway, they must merge into quickly narrowing traffic. After only a couple minutes of observation, we witnessed one cyclist make a treacherous right turn from Denny directly on to Broadway. By not crossing the street, this turn now means taking the lane or somehow threading an impossibly narrow space between car and concrete barrier. 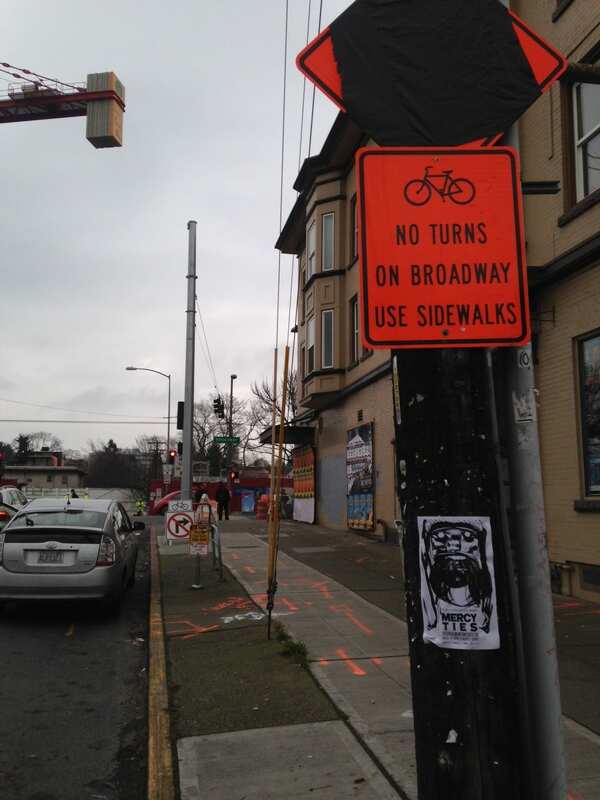 The mess at Broadway and Denny is scheduled to last throughout 2014. The first phase of construction will require the west side of Broadway to remain closed through July. The east side of Broadway will close during the second half of the year. Part of Denny Way will also be closed through July. The construction will also impact early ridership numbers that SDOT is tracking. Melone told CHS the first set of data will be released sometime next month. As cyclists roll with the headaches, it’s worth remembering why: an unprecedented public transportation project in Capitol Hill and a mile-long stretch of protected bike path coming in the not too distant future. It’s also worth remembering there’s an excellent restaurant that’s having to bear a big burden during this transformative year. This entry was posted in News, etc. and tagged bikes, broadway, capitol hill station, light rail, streetcar by Bryan Cohen. Bookmark the permalink. They spent all kinds of money to construct the bikeway and then only a week ago they decided to destroy part of the bikeway that they created. I guess projects don’t communicate with each other or it’s just “make work” so people don’t have to stand around looking unemployed. I have seen very little use of the cycle track, but admittedly I don’t drive along there very often, and it seems to be quite dangerous in places. I really have to question this project and all the money that was spent on it, not to mention the expensive cleaning vehicle that was recently purchased. The phasing of these projects leads me to believe that the safety of those using the bike way was not a serious consideration during the planning process. The city has made such a mess out of it, I’ve stopped driving on Broadway. It’s much easier to just take 12th Ave instead. Shame to see money wasted on this strip of roadway while the rest are crumbling away. > The fact that it is only four blocks long, and therefore does not support through trips the way that 12th ave does. > The dangerous merges on either end of the usable section. Including the conditions created by the concourse construction at Denny and the ongoing streetcar construction at Union. What Dan said. 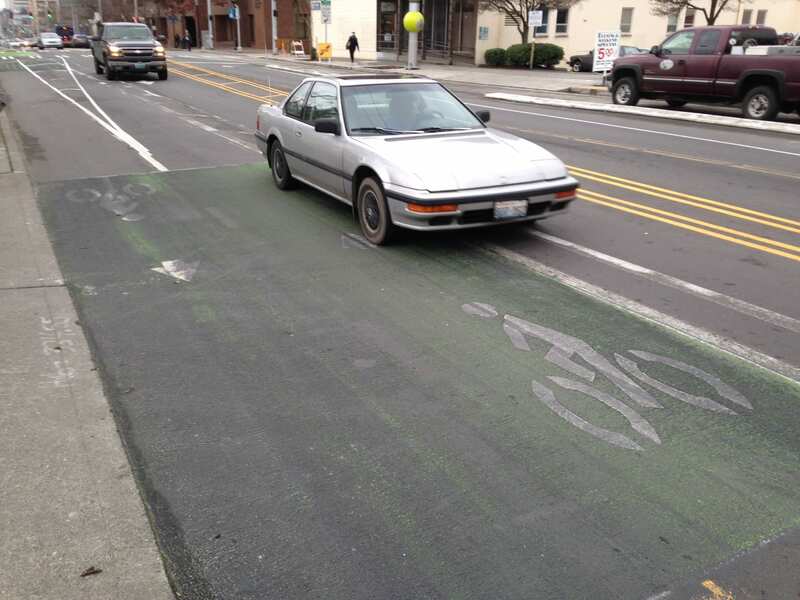 Why would a four-block long bike lane encourage anyone to ride down Broadway? If it ran the entire length of the street, even starting at Pike, until it matched up with 10th Ave, it would be useful. Right now it’s just a nuisance to cars and undesirable for cyclists.